This look reminds me so much of my college days. I was all about t-shirts, jeans, sneakers and baggy fit cardigans. Comfort was key. I guess not much has changed! 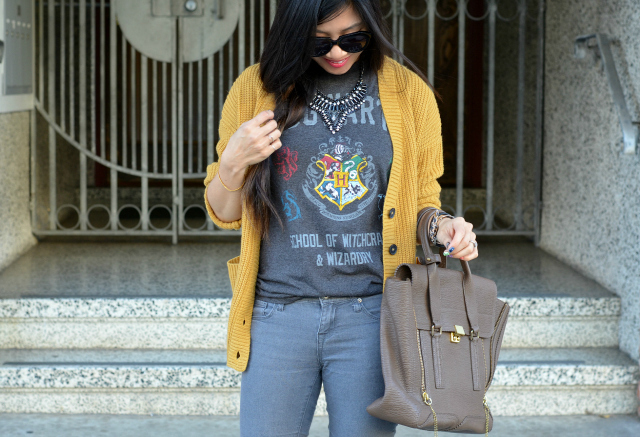 I couldn't help but get this Harry Potter t-shirt when I saw it at Target in the men's section. I loved reading the books and watching the movies. The magical world seemed so delightful compared to the "muggle" world. That is definitely the nerd in me. That's a really cool tee Nancy! Love the way you styled it. Love the necklace and the sweater! The color of your cardigan is perfect. I can't resist a cozy sweater! Also, I love your HP tee. Smart to keep an eye out in the men's section! I'm so jealous that you can wear yellow! It makes me look sick. 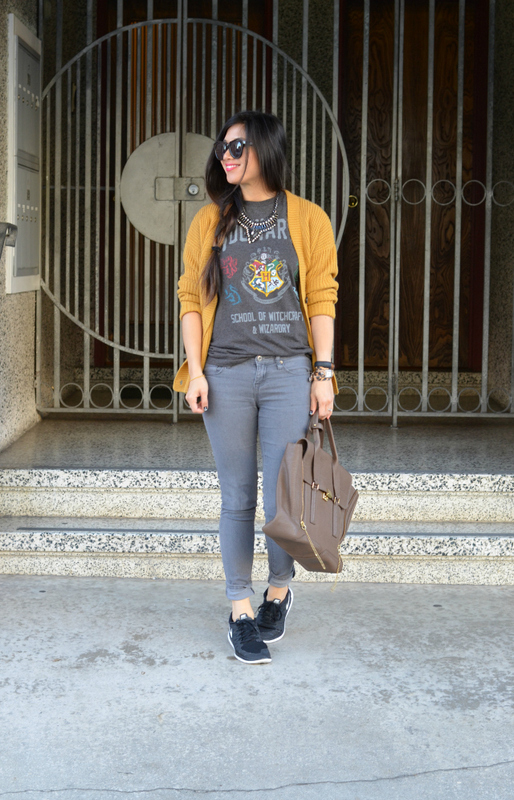 Totally love your Harry Potter tee...so cute with that mustard cardi! 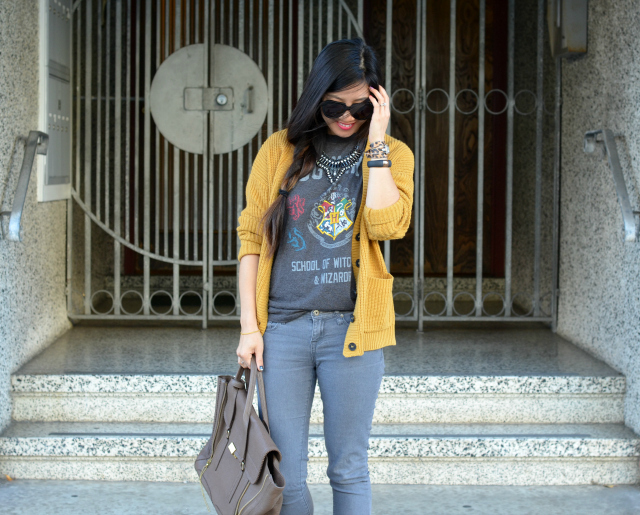 I love yellow and gray together and swooning over the Phillip Lim bag and Harry potter tshirt. There's a little nerd in all of us! That shirt is the greatest thing ever! Yay for HP fans!! Love the big cardigan too! 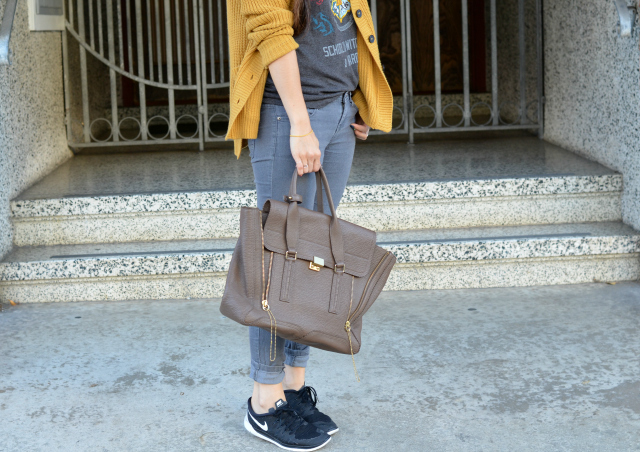 Good use of colors and a great comfy & chic outfit. I have not seen or read any of the Harry Potter movies/books. I plan to read it one of these days and maybe see the movie. The sweater is the perfect pop of color to this cute tee!!! I've never seen Harry Potter (yep!) but I do love this casual look! The yellow cardigan was a nice touch! ah such a great shirt! :) and great cardigan too! i actually started reading harry potter during finals my senior of college. that was pretty bad... i kept wanting to read the books instead of studying! I love the mustard cardigan. I remember when that color was the color for fall a couple of years ago and everyone wanted a cardigan just like that!